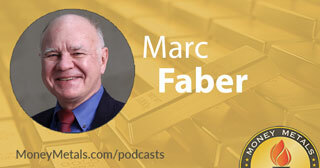 Coming up the one and only Marc Faber joins me for an amazing conversation on the state of the U.S. economy, where he sees value, where he sees problems and gives advice to those considering gold as a safe haven investment. Don’t miss an interview with Marc Faber of The Gloom, Boom and Doom Report, coming up after this week’s market update. A busy news week in Washington and an aggressive new U.S. push for regime change in Syria left markets little affected through Thursday. Both the U.S. stock market and gold finished little changed on the week before U.S. air strikes in Syria commenced. Gold began rising in after hours trading Thursday night. As of this Friday recording, gold prices come in at $1,266 an ounce and are registering a weekly gain of 1.2% with most all of that coming here on the final trading day of the week. Silver is now in positive territory for the week and is up 0.2% since last Friday’s close to trade at $18.40. Meanwhile both platinum and palladium are putting in slight weekly gains, with platinum now trading at $969 an ounce and palladium at $810. The U.S. dollar advanced against foreign currencies mid week as the Federal Reserve released the minutes from its latest meeting. Fed officials expressed some concern over lofty valuations in equity markets. But they didn’t come out and admit their role in inflating the latest asset bubbles. They did indicate they intend to pursue additional rate increases and eventually shrink their $4.5 trillion balance sheet. If the Fed moved to unload bonds, mortgage-backed securities, and other assets it holds back into the market, it would be playing with fire. The Fed’s hawkish tone caused the stock market to give back most of their earlier gains. Speaking of hawks, President Donald Trump’s foreign policy advisors convinced him to order Tomahawk missile strikes on Syrian air fields. The strikes began Thursday night. The interventionist wing of the Republican Party has been pushing hard for military action in Syria and Iran. Trump had always positioned himself in opposition to these war hawks. However, earlier this week, President Trump did a massive flip flop. After campaigning against the expensive regime changing, nation building, and global policing policies of Presidents Obama and Bush, Trump said he changed his mind – at least on the issue of letting Assad stay in power. To voters who thought they were electing a different kind of Republican, Trump’s hasty retreat of non-interventionism is a big letdown. His apparent embrace of neo-conservative Middle East crusades couched in humanitarian rhetoric means that military and foreign aid spending will probably accelerate during his term. That will put upward pressure on the budget deficit and put any potential tax cuts in jeopardy. And if Trump and Congressional Republicans can’t find a way to deliver on their promise of repealing and replacing Obamacare, they will have completely betrayed the voters who put them into office. For now, investors seem willing to forgive Republicans for their rocky start this year. Political disappointments have had little effect on the stock market or the public’s appetite for shares. Inflows to exchange traded funds hit a record $135 billion in the first quarter. That’s up from just $30 billion over the same period last year. As financial markets swell with cash, physical precious metals markets continue to be overlooked by the mainstream. The upshot for contrarians is that premiums on most gold and silver bullion products are extraordinarily low. Today, we are able to offer bags of historic U.S. 90% silver coins for less than $1 per ounce over spot. This value opportunity is especially attractive when it comes to 90% silver quarters and dimes minted before 1965 because they usually command much higher premiums. In recent years premiums on 90% silver have swung dramatically. In September 2015, shortage of that particular form of silver meant we had to quote premiums as high as $6 over the silver spot price on so-called “junk” silver. A similar premium spike occurred in late 2008 and early 2009 as the financial crisis caused the physical market to decouple from the paper market. Holders of silver futures contracts and silver exchange-traded products didn’t see any premium bump. These financial instruments won’t reflect any shortage-induced premium spikes in the coin market. Owning pre-1965 silver coins give you the opportunity to see the value of your holdings diverge positively from paper prices during times of financial stress and/or heavy physical demand. You get a potential downside cushion and upside boost without having to pay extra for these advantages or take on any additional risk. For gold investors, non-numismatic pre-1933 U.S. Libertys and Double Eagle coins for sale are well worth considering. The ones that come graded and slabbed will carry hefty collectible premiums. But the historic gold coins that Money Metals Exchange makes available currently sell for close to their melt value. Supplies of these coins are limited, and it’s possible that in the future their premiums will go up. But right now, just like silver junk coins, these circulated gold coins are a super bargain. You can order these or any other popular bullion products that we carry either online at MoneyMetals.com or by calling 1-800-800-1865. Dr. Faber, thank you so much for joining us again and how are you? Mike Gleason: Well, to start out here Dr. Faber, before we get into some other stuff I wanted to hear your comments on the state of the U.S. economy. Now, it appears the Federal Reserve has finally gotten serious about moving rates higher at least modestly. U.S. equity markets seem to be discounting that fact, focusing instead on the so called Trump trade. Markets are pricing in a huge infrastructure spending program and tax cuts stimulates that could overwhelm any modest tightening at the Fed. Now that efforts to reform healthcare seem to be failing we expected some of the optimism surrounding president Trump's other initiatives would leak out of the stock market but so far that hasn't happened. Stocks remain near record highs and there isn't a whole lot of interest in safe haven assets including precious metals. So what are your thoughts here Marc? Is now a time to take some profits and move towards safety or is there still some good upside in equities? Marc Faber: Well, I think that in terms of the economy I don't think the economy is as strong as people believe or as the statistics would show and recent trends have rather been indicating some weakness is auto sales, not a particularly strong housing market and we have several problems as a result of excessive credit. So I think that the economy is not going to do as well as people expect and concerning the huge infrastructure expenditure that Mr. Trump has been talking about, it is about a trillion dollars over ten years, maximum. In other words a hundred billion a year. In China in 2016 in the first ten months the infrastructure expenditures were 1.6 trillion, in other words 16 times higher than what Mr. Trump is proposing. So just to put this in a perspective. Now throughout Asia and the emerging world there will be a lot of infrastructural expenditures in the years to come. The question is will stocks go up because of that, maybe some stocks will go up and some will not. So we have to be now increasing the selective in what we purchase in terms of equities. My sense is that the economy in the U.S. is weakening and not strengthening. Marc Faber: Well, basically some people say that the central banks are out of bullets. This is not my impression. They can keep on printing money and boost asset prices where by not all asset prices will go up, some will go up and some will go down. But the point I want to make is the central banks are not really out of bullets. The economy, if it weakens some stocks will outperform others, in other words recently you've seen the weaker in automobile stocks, so there is still a selective process in the market. The stocks that have gone up the most recently are actually mostly companies with very little earnings, very high evaluations, Tesla, Amazon, Netflix and so forth and we’ll have to see. Marc Faber: Well, whether it's sustainable or not the fact is that the Chinese economy has been improving recently, somewhat. Maybe it's all driven by credit but for now they have stabilized the economy, it's improving and it has had a huge impact on the prices on resources including copper and zinc and nickel and so forth and it has had a favorable impact on the Asian market. Earlier you asked me about the U.S… this whole euphoria about the performance of U.S. stocks, the fact is in Asia just about every market has outperformed the U.S. In Europe just about every market has outperformed the U.S. measured in U.S. dollar terms. So, I think that the impact of an improving Chinese economy is being felt more in other emerging economies than say, in the United States. Marc Faber:Well, I've just written two reports recently highlighting that in Europe there are some companies, mostly utilities and infrastructure related companies that on a valuation screen appear relatively attractive. They have dividend yields of between four and six percent, the Euro is weak or has been weak and is at the low level and these yields of four to six percent are very attractive considering the bonds yield in Europe. And so I think that this year European stocks and especially the stock I mentioned, infrastructure plays, utilities and also food (stocks) will way out perform the U.S. I also happen to think that there will be more and more American companies and foreign companies that will be interested to acquire European companies. Marc Faber: Well, this is the big question and we all don't know exactly what the answer is. My sense is that the Euro will stay and if some weak countries decide to leave the Eurozone, their currencies will be obviously punished. And if some weak countries decide to leave the Eurozone, I think the euro will strengthen. It’s just that if Italy decides to leave the Eurozone, the euro will strengthen but obviously, the new currency (of Italy) will weaken. And so, I think that this Is not a big concern for me. Marc Faber: Well, at the beginning of the year so many people have started to write reports about the surprise of 2017 and projections of 2017, so everybody has a view, nobody knows precisely and the lot will depend on central banks’ monetary policies. I don't believe central banks can tighten meaningfully, maybe optically they do some, but in general I think they'll keep money printing on the table as far as we can see, in other words, for the next few years. And eventually it will be friendly for precious metals and hard assets. Number two, hard assets such as precious metals are at the historical low point compared to financial assets, so I think that's going forward there’s a huge discrepancy in the performance between financial assets which has been very good since 2009 and gold which has been more mixed… it's also up but it's been more mixed especially after 2011… that these hard assets will come back into favor. Marc Faber: It's my pleasure, the best is to go on the website www.GloomBoomDoom.com – it’s all written in one word. And don't forget to check back here next Friday for our next Weekly Market Wrap Podcast, until then this has been Mike Gleason with Money Metals Exchange, thanks for listening and have a great weekend everybody.